Background: Almost all presently available pediatric echocardiography Z-score nomograms are based on Western data. They may not be a suitable reference standard for assessing the sizes of cardiac structures of children from developing countries. Objective: This study's objective was to collect normative data of 21 commonly measured cardiovascular structures using M-mode and two-dimensional echocardiography in Indian children aged between 4 and 15 years and to derive Z-score nomograms for each. Subjects and Methods: The study was conducted at two centers in India . Ajmer, Rajasthan, and Mohali, Punjab. We studied a community-based sample involving healthy school going children. After excluding children with cardiovascular abnormalities on the screening echocardiogram, 746 children were included in the final analysis. Echocardiographic assessment was performed using a Philips iE33 system. Results and Analysis: For each parameter measured, seven models were evaluated to assess the relationship of that parameter with the body surface area and the one with the best fit was used to plot the Z-score chart for that parameter. Z score charts were thus derived. Conclusions: The Z-score nomograms derived by this study may be better alternatives to the Western nomograms for use in India and other developing countries for preprocedural decision making in the pediatric population. However, they will require validation in large-scale studies before they can become clinically applicable. Description of the sizes of cardiac chambers, valves, and great vessels in terms of Z-score is an important step in quantifying abnormal findings and planning pediatric cardiac interventions and cardiac surgeries. Currently used nomograms are based on the Western studies and may be inappropriate for use in developing countries. One of the methods to depict the deviation of a specified structure's measured value from the population mean is the Z-score. It provides a way to record and compare serial measurements in children undergoing sequential echocardiographic measurements over time. By definition, Z = (x − µ)/σ, where x is the child's measured value for the specified structure, µ is the mean of the population the child hails from, and σ is their standard deviation. Studies providing Z-scores for various cardiac structures are available, and it is with the help of these references that current day practitioners of pediatric cardiology derive Z-scores for their patients. For the assessment of acquired and congenital heart disease (CHD) in children, quantification of cardiac chambers, valves, and great vessels is of absolute importance since major decisions regarding the need for and timing of intervention is made on the basis of these values. The Z-score for each measured parameter is assessed from nomograms or Z-score charts, which are available on dedicated websites and as smartphone applications. The routine practice world over is to use one of these sources to get the individual patient's Z-score for the measured parameter. Almost all of these nomograms are derived from studies done in developed countries. Thus, key decisions like necessity for and timing of intervention in children with CHD hailing from developing countries are made based on Western standards. Since biological parameters often vary between populations due to differences in ethnicity and environmental influences, Western data may not serve as a suitable reference standard for the developing countries. A detailed search on the available pediatric echocardiographic Z-score studies from countries in Asia and the Middle East (our search included India, Bangladesh, Nepal, Myanmar, Bhutan, Pakistan, China, Singapore, Taiwan, North and South Korea, Hong Kong, Japan, and Saudi Arabia) revealed only two published studies, both of which had focused on coronary artery diameter z scores., Therefore, the primary objective of our study was to derive echocardiographic nomograms.for the commonly measured cardiac structures in healthy Indian children (early childhood to adolescence). The study was conducted at two centers in India with the objective of collecting normative data for the measurements of the various cardiac structures using M-mode and two-dimensional (2D) echocardiography in normal children aged between 4 and 15 years and to calculate Z-scores for each measured parameter. Seven hundred and forty-eight children were enrolled at Ajmer, Rajasthan, and thirty at Mohali, Punjab. Children were recruited from three different schools of Ajmer. In the Mohali center, children accompanying patients attending an adult cardiology facility were enrolled. Children with any chronic underlying disease or a CHD were excluded from the study. After obtaining written informed consent from the parents, the children were evaluated clinically followed by echocardiographic screening. Echocardiographic evaluation was performed using a Philips iE33 system (Philips Medical Systems, Bothell, WA, USA). 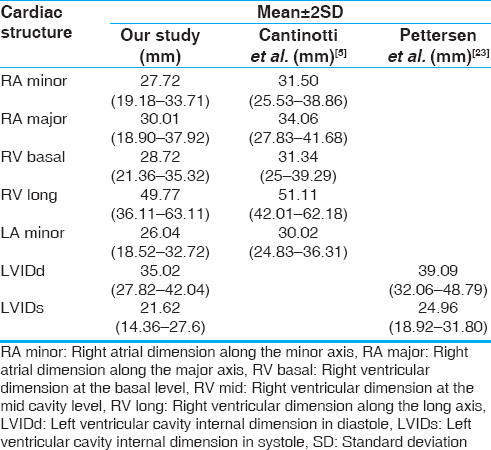 The 2D and M-mode measurements of 21 cardiovascular structures were obtained for each subject. Age-appropriate transducers (4–12, 2–7, 2–5 MHz) were used. Echocardiograms were obtained at the standard precordial positions. We followed the recommendations for standardizing measurements made from M-mode and 2D quantification echocardiograms as described by Lopez et al. 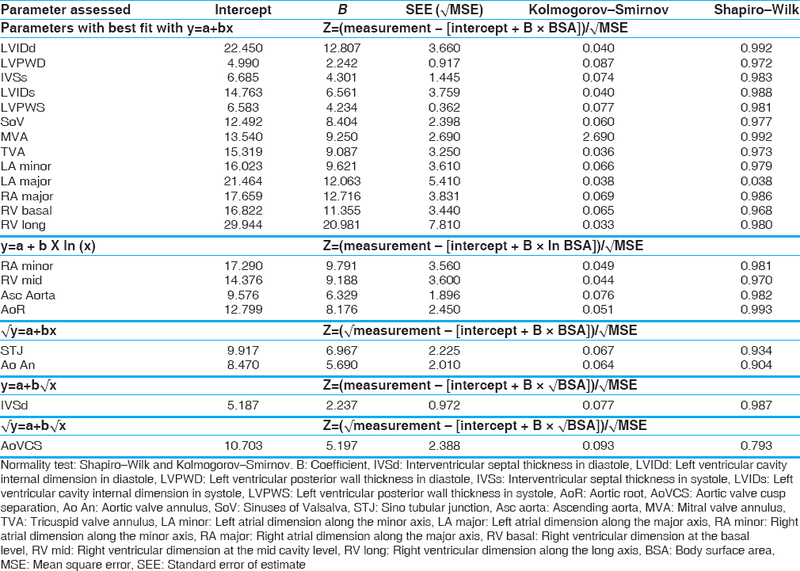 The views utilized and the methods employed for measuring the 2D echocardiographic parameters are shown in [Table 1]. Two operators (one in the Ajmer center and the other in Mohali) were involved in the acquisition of echocardiographic measurements. Since only thirty subjects were evaluated at the Mohali center, a formal inter/intra-observer variability analysis was not performed. The measurements acquired by fellows in training were reassessed by the senior consultant (offline), and when found nonsatisfactory, repeat evaluation was done subsequently. The data obtained were expressed in relation to body surface area (BSA) calculated by Haycock's formula (BSA = weight 0.5378 × height 0.3964 × 0.024265). For sample size calculation, we followed the method used by Cantinotti et al. The population of interest was divided age-wise into four sections (section 1, 4–6 years; section 2, 73 months - 8 years; section 3, 97 months - 10 years; and section 4, 121 months - 15 years). The standard deviation of the population was assumed as 0.5 and distribution of the variables as normal., A minimum of 100 subjects per age section would be needed to reach a 95% confidence interval at a margin of error of 0.1. All the 21 measurements might not be available in the echocardiographic examination of every subject. Giving allowance for this fact, a higher number of subjects were deemed necessary in each study section. We assumed that at least 70% examinations would be complete, containing all the 21 measurements. This meant we needed a minimum of 140 subjects per se ction to reach the 95% confidence interval. Thus, we arrived at the final sample size of ≥560 subjects. Seven hundred and forty-eight children were evaluated at Ajmer, Rajasthan, and thirty at Mohali, Punjab. 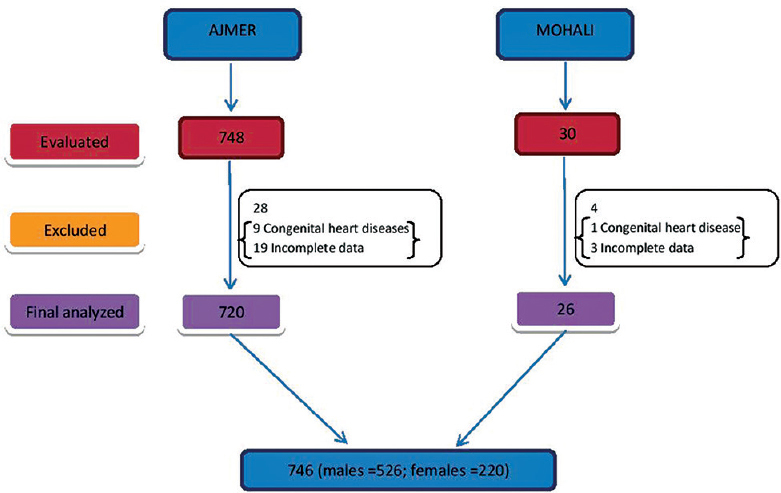 After excluding children who had CHD in the screening echocardiogram and incomplete examinations, the final number of subjects included in the analysis was 720 from Ajmer and 26 from Mohali [Figure 1]. 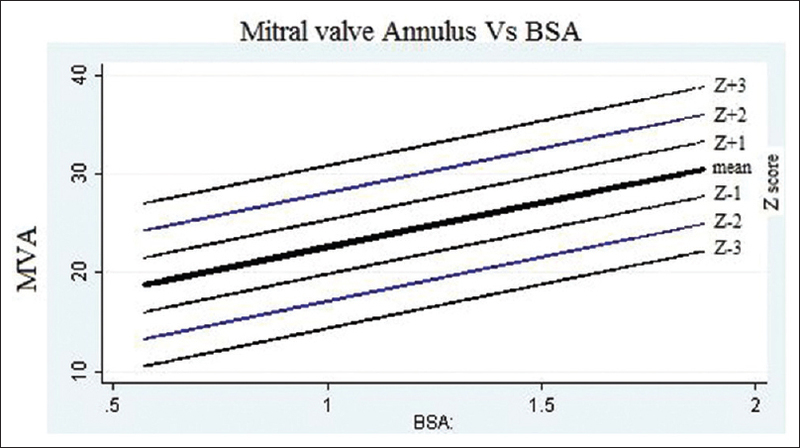 To assess the relationship of a parameter with the BSA, regression equations were used. We chose seven different models of regression namely;- (1) linear: y = a + bx, logarithmic: (2) y = a + b ln[x], (3) ln[y] = a + bx), exponential: (4) ln[y] = a + b ln[x]) and square root: (5) y = a + b√x, (6) √y = a + bx, (7) √y = a + b√x, which were applied to each measured parameter. As one of the assumptions of regression analysis is that the residuals should be normally distributed, Shapiro–Wilk and Kolmogorov–Smirnov tests were employed for assessment of normality of residuals. The regression equation which had the highest R 2 (goodness-of-fit) was selected. Thus, for each measured parameter, we came up with one best regression equation out of the seven. Z-score charts for all the studied parameters were then derived [Figure 2], [Figure 3], [Figure 4], [Figure 5], [Figure 6], [Figure 7], [Figure 8], [Figure 9], [Figure 10], [Figure 11]. The parameters, the best fit model for each, and the respective R 2 values are shown in [Table 2]. The regression equations are provided in [Table 3]. The analysis was done using Stata version 14.1 for Windows;Stata Statistical Software Release 14. College Station Tx:StataCorp, LP. 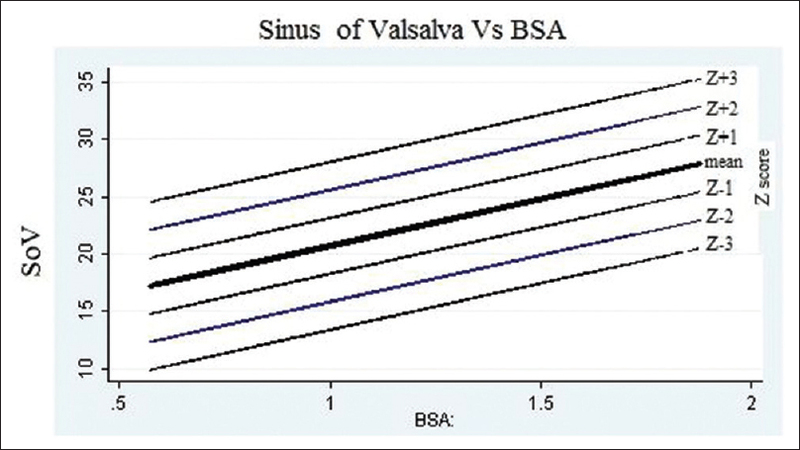 To calculate the Z-score for a subject using these regression equations in [Table 3], the user has to substitute the subject's BSA and the measurement for the concerned parameter and the other values as provided in the table. The other way is to directly plot the measurement in the Z-score charts provided and directly arrive at the Z-score. Due to space constraints, the Z-score charts are provided only for ten parameters. The authors would be happy to provide interested users with the Z-score charts for the other parameters on request. The study included 746 healthy children, age ranging from 4 to 15 years. Seventy-one percent were boys and 29% were girls. The BSA ranged from 0.57 cm 2 to 1.88 cm 2, median of 0.95 cm 2, and interquartile range (IQR) of 0.8–1.12 cm 2. The weight ranged from 11 kg to 77 kg, median of 25 kg, and IQR of 20–33 kg. The height ranged from 95 cm to 180 cm, median of 131 cm, and IQR of 119–143 cm. 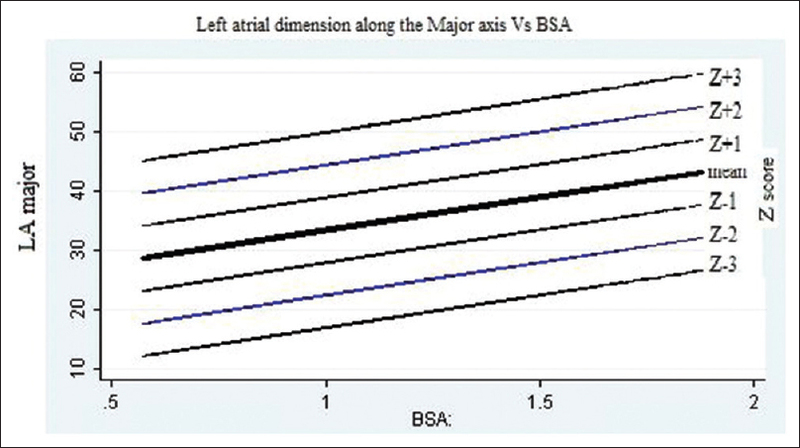 The distribution of BSA in the study subjects is shown in [Table 4]. The World Health Organization growth charts  based on Western data ,,, were found to grossly underestimate growth in Indian children. The current day under-5 growth charts  were designed after elaborate studies in developing countries. On the same lines, utilizing Western Z-score standards for deriving Z-score values in Indian children or children from any other developing country might lead to erroneous judgments and faulty decisions. Almost all published data on Z-scores of various heart structures have been based on studies conducted in the West. All pediatric centers in India and other developing countries have depended on these Western data till date for Z-score calculations for their young patients. Although there is no direct proof that growth parameters and dimensions of the heart vary between Western and Indian children, reasons exist to believe they do. Therefore, separate Z-scores charts based on indigenous studies are needed in developing countries. There have been multiple studies for calculating Z-scores of various cardiac structures. The most recent publications in this area ,,,,, reveal that none of the latest Z-score research has come from any developing country. As seen in [Table 5], the majority of parameters had values, which were uniformly lower in comparison to the Western standards. This reinstates our emphasis on the need for an indigenously developed Z-score nomogram for use in developing countries. 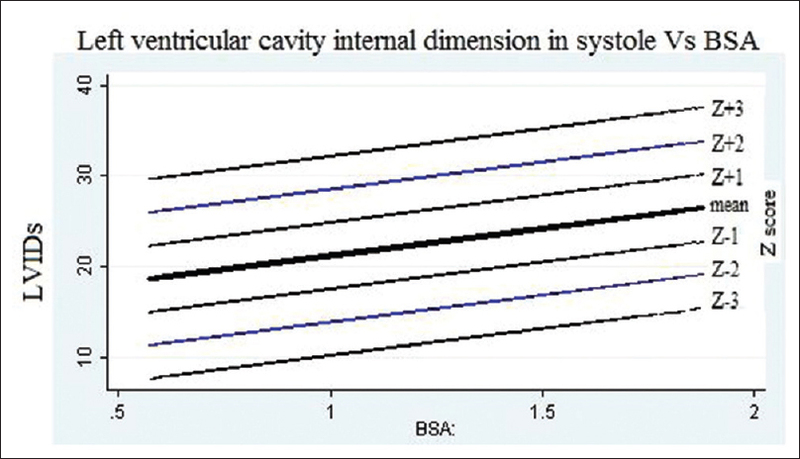 This study has attempted to derive Z-scores for various 2D Echo and M-mode parameters in Indian children. The study subjects have been chosen from school going children. This community-based sampling adds to the strength of the study. Children included in the study represent multiple socioeconomic strata in our society. While this increases the external validity of our findings, the effects of varying nutrition and hence body weight and BSA may explain the relatively low R 2 values. Z-score nomograms for main and branch pulmonary arteries, aortic isthmus, and transverse aortic arch were not included as they were planned as a part of a subsequent study. The Z-score nomograms derived by this study might serve as better alternatives to the Western nomograms for use in India and other developing countries for preprocedural decision making in the pediatric population. However, they will need to be validated in large-scale studies before they can become clinically applicable. The guidance and support by Dr. Sitaraman Radhakrishnan (Head, Pediatric Cardiology, Fortis Escorts Heart Institute, Okhla, New Delhi) ever since this study was conceived, right till the very end, provided the authors, the much required boost to run the entire course until the completion of this study. The authors would like to acknowledge with heartfelt gratitude, the help rendered by Dr. Madhav Gopal Agarwal in arranging and coordinating the echocardiographic examination sessions of the children from the three schools in Ajmer. We are extremely thankful to the senior nursing staff of the noninvasive cardiology laboratory, Mrs. Madhulika Roy and Mrs. Suman Uphadhyay, for their unflinching support during the examination and echocardiographic data acquisition phase of the study and Mrs. Asha Pathak for also doubling up as an extremely efficient data entry operator/supervisor. We are indebted to the nonphysician cardiac sonography students – in-training, Mr. Damodhar Nehara, Mr. Mahendra Kumar Sharma, Mr. Deepa Ram Jakhar, Mr. Mohan Ram Gawadiya, and Mr. Vimal Gahlot for their painstaking efforts and the long hours they spent with us during the data entry and data classification phase. We shall fail in our duty if we forget to mention the dedicated duo, Mr. Mohamed Ali. J and Mr. Heber Anandan, but for whose valuable inputs, the statistics part would have remained incomplete. Finally, a million thanks to the school teachers for sparing their valuable time and the participant children for their invaluable contribution to this study. This study was awarded the Dr. Krishnam Raju award for the best paper at the 17th Annual Conference of the Pediatric Cardiac Society of India 2015 held at Hyderabad, India. Zhang Y, Chen S, Huang G, Zhang H, Huang M, Wang S, et al. 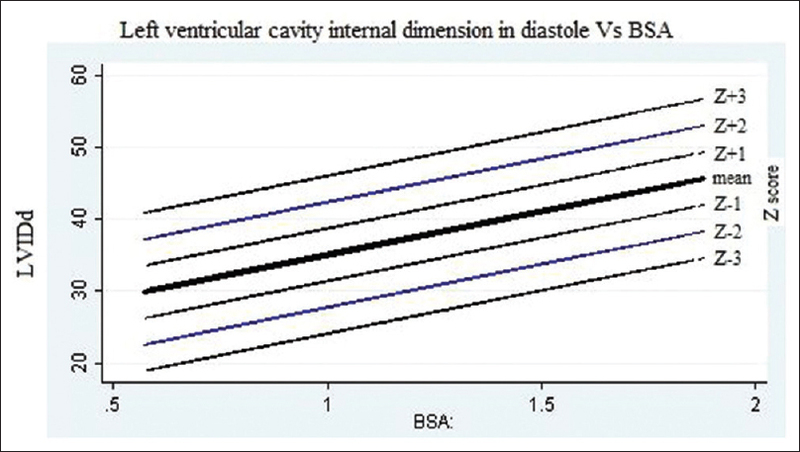 Coronary artery indexed diameter and Z-score regression equations in healthy Chinese Han children. J Clin Ultrasound 2015;43:39-46. Lin M, Chang C, Hsieh W, Chang C, Chang Y, Chen Y, et al. 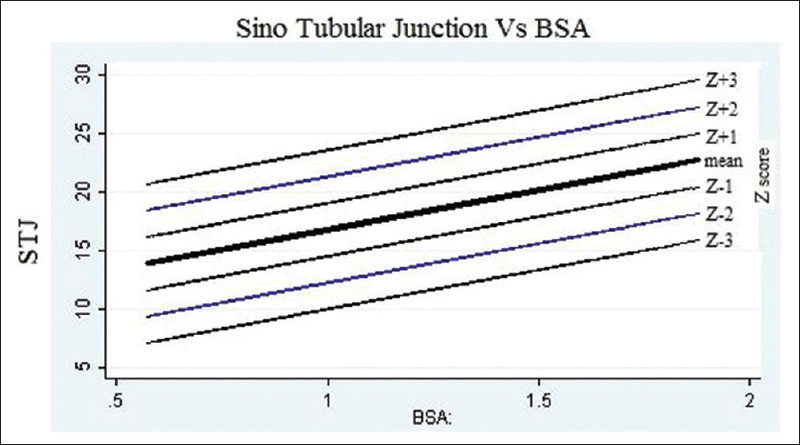 Coronary diameters in Taiwanese children younger than 6 years old: Z-score regression equations derived from body surface area. Acta Cardiol Sin 2014;30:266-73. Haycock GB, Schwartz GJ, Wisotsky DH. Geometric method for measuring body surface area: A height-weight formula validated in infants, children, and adults. J Pediatr 1978;93:62-6. Cantinotti M, Scalese M, Murzi B, Assanta N, Spadoni I, De Lucia V, et al. Echocardiographic nomograms for chamber diameters and areas in Caucasian children. J Am Soc Echocardiogr 2014;27:1279-92.e2. Thompson W, Endriss J. The required sample size when estimating variances. Am Stat 1961;15:22-3. Kish L. Survey Sampling. New York: John Wiley and Sons, Inc.; 1965. World Health Organization. A Growth Chart for International Use in Maternal and Child Health Care. Guidelines for Primary Health Care Personnel. Geneva: World Health Organization; 1978. Chavez R, Frenk S, Galvan RR, Gomez F, Munoz JC, Vazquez J. Mortality in second and third degree malnutrition. J Trop Pediatr (Lond) 1956;2:77-83. Waterlow JC, Buzina R, Keller W, Lane JM, Nichaman MZ, Tanner JM. The presentation and use of height and weight data for comparing the nutritional status of groups of children under the age of 10 years. Bull World Health Organ 1977;55:489-98. Karlberg P, Taranger J, Engstrom T, Karlberg J, Landstrom T, Lichtenstein T, et al. The somatic development of children of a Swedish Urban Community. A prospective longitudinal study. Acta Pediatr Scand Suppl 1976;(258):7-31. Van Wieringen JC, Wafelbaker F, Verbrugge HP, de Haas J. Growth Diagrams. Netherlands: Wolters-Noordhoff Groningen; 1965. Agarwal DK, Agarwal KN. Physical growth in Indian affluent children (birth-6 years). Indian Pediatr 1994;31:377-413.
WHO. Child growth standards. Acta Pediatr Suppl 2006;450:5-101. Chubb H, Simpson JM. The use of Z-scores in paediatric cardiology. Ann Pediatr Cardiol 2012;5:179-84. Cantinotti M, Scalese M, Murzi B, Assanta N, Spadoni I, Festa P, et al. 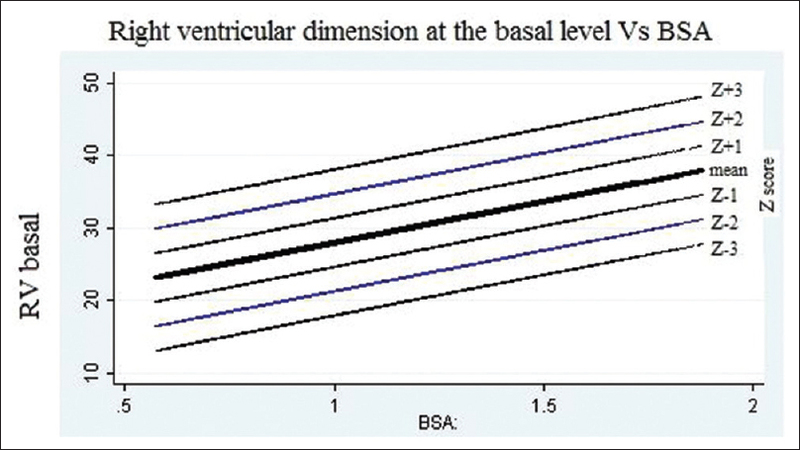 Echocardiographic nomograms for ventricular, valvular and arterial dimensions in Caucasian children with a special focus on neonates, infants and toddlers. J Am Soc Echocardiogr 2014;27:179-191.e2. Koestenberger M, Nagel B, Ravekes W, Avian A, Burmas A, Grangl G, et al. 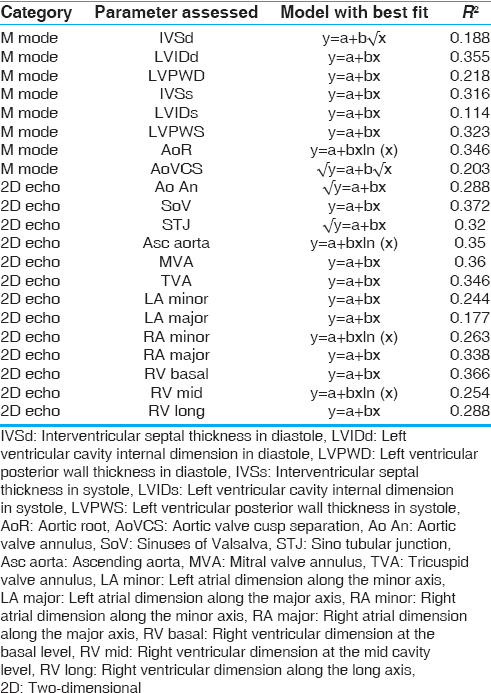 Reference values and calculation of Z-scores of echocardiographic measurements of the normal pediatric right ventricle. Am J Cardiol 2014;114:1590-8. Dallaire F, Dahdah N. New equations and a critical appraisal of coronary artery Z-scores in healthy children. J Am Soc Echocardiogr 2011;24:60-74. Núñez-Gil IJ, Rubio MD, Cartón AJ, López-Romero P, Deiros L, García-Guereta L, et al. 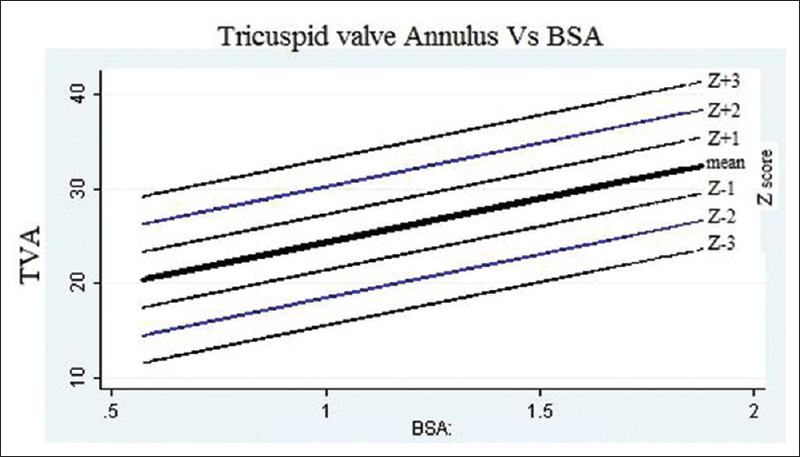 Determination of normalized values of the tricuspid annular plane systolic excursion (TAPSE) in 405 Spanish children and adolescents. Rev Esp Cardiol 2011;64:674-80. Gautier M, Detaint D, Fermanian C, Aegerter P, Delorme G, Arnoult F, et al. 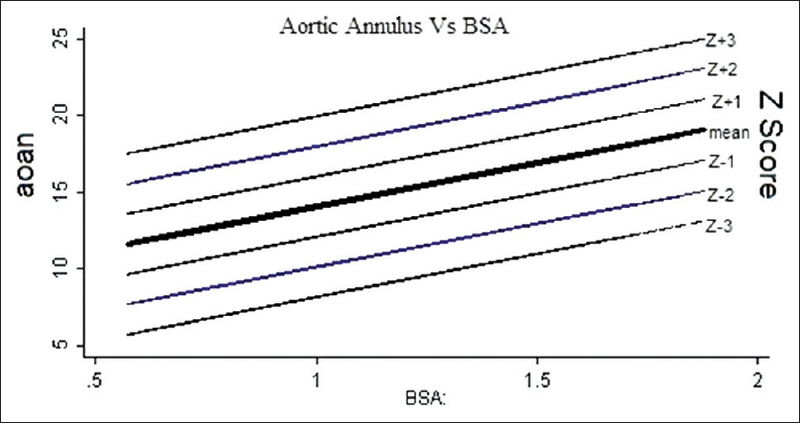 Nomograms for aortic root diameters in children using two-dimensional echocardiography. Am J Cardiol 2010;105:888-94. Faddan NH, Sayh KI, Shams H, Badrawy H. Myocardial dysfunction in malnourished children. Ann Pediatr Cardiol 2010;3:113-8. Bergman JW, Human DG, De Moor MM, Schulz JM. Effect of kwashiorkor on the cardiovascular system. Arch Dis Child 1988;63:1359-62. Pettersen MD, Du W, Skeens ME, Humes RA. 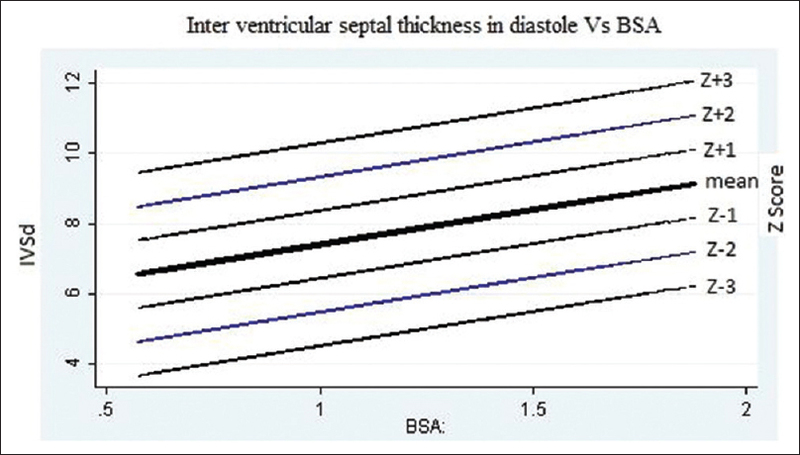 Regression equations for calculation of Z scores of cardiac structures in a large cohort of healthy infants, children, and adolescents: An echocardiographic study. J Am Soc Echocardiogr 2008;21:922-34.